The audio-visual theory of diegesis probably does have some form of basic, traditional film theory equivalent. The splitting of film sound into what the characters and the audience can hear and the differences and problems this can cause are the basis for so much, often excessive, film sound theory. 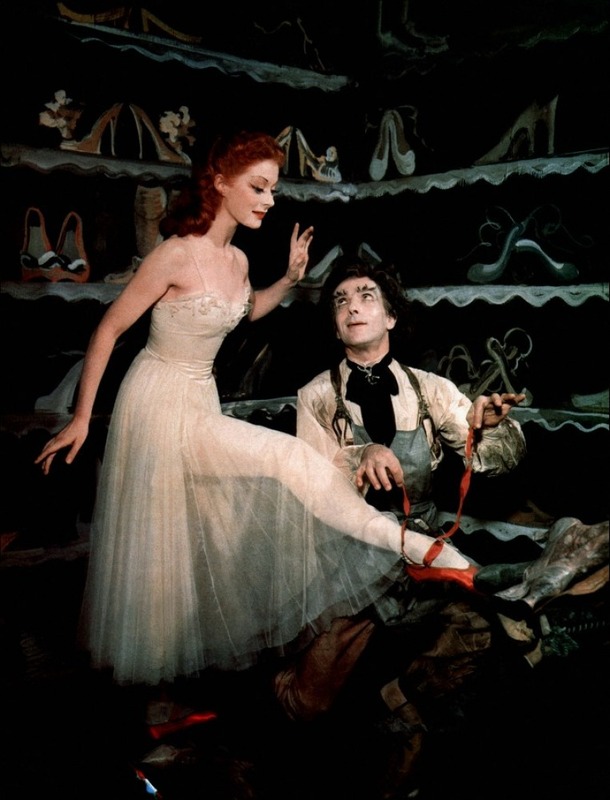 For a film such as Michael Powell and Ernest Pressburger’s The Red Shoes (1948), the audio theory seems far more apt for analysing its most famous dance sequence rather than using whatever its visual counterpart in theory. The film is not going to be given any sort of grounding here. For readers unfamiliar with the film or the sequence about to be discussed, a video of the whole scene is found at the end of the article though some basic reviews and critiques of the film may be worth reading to contextualise exactly where the scene fits in within the rest of the film. The highpoint of the film comes in the form of an extended dance sequence roughly fifteen minutes in length. This is Victoria Page’s (Moira Shearer) first big stage dance for a new reworking of Hans Christian Anderson’s The Red Shoes; a tale which mirrors the decisions and trajectories of Victoria herself. The scene in question begins when the ballet begins. There is a long musical opening for the ballet, given little attention during its performance though it sets up the idea of two audiences viewing the ballet; the audience in the film and the viewer of the film. This is key to breaking down the scene as it opens up and explains some of the more surreal elements of the visuals. The point of bringing in the diegesis theory is one, more for irony than anything else, chiefly because the music is the one true constant in the sequence rather the inverse of this often found in cinema. The main point of switching between reality and fantasy is perhaps not as fantastical as the visuals would have the viewer belief, especially with the theory of metadiegetic sound allowing viewers of other films to enter the inside of any given character’s thoughts and feelings. What both audiences see at the very beginning is a shared view of the stage ballet, showing the shoe maker dancing around the shoes mischievously. This quickly cuts to what looks like an MGM musical film set, far bigger than the stage the diegetic audience can clearly see. This is linked squarely with the arrival of Page onto the stage, clearly signifying that the fantastical elements are being shown from the character’s viewpoint; an ironic placement of being shown the character of the film actually thinking within the character of the ballet she is dancing. Her interpretation of the fantasy world of the ballet is what the film viewer sees and this can be seen as diegetic to the performer but nondiegetic to the audience within the theatre. The presence of this audience is what makes this theory work so well. Even when the viewer is obviously experiencing Page’s take within the dance world, they are still sharing the audio experience with the audience in the film. Page begins to bring in her own character’s problems and acquaintances into the dance, imagining first the ballet’s producer Boris Lermontov (Anton Walbrook) and then her future love and the ballet’s new composer Julian Craster (Marius Goring). This finally solidifies that what the film’s viewer is actually seeing is the dancer’s internal characterisation; her almost method-like technique of performance within the actual ballet of The Red Shoes. This is different of course to what the audience in the film is seeing but Powell and Pressburger again trick the viewer with this by shooting obviously large sets of the fantasy in exactly the same way as the opening in the actual, visual theatre. The camera of course cuts to all sorts of fantastical happenings but always comes back to the locked off shot which mimics and parallels the opening curtain shot. The dance gradually progresses into more and more fantastical elements moving not just two dimensionally but within three with Page moving up and through the air, constantly battling against the increasing power of her dancing red shoes. There are obvious contrasts to the decisions she’ll be forced to make later on within the film, again brought into play through showing the inner character’s take on the ballet storyline but the scene is more than merely a flashy hint of the stress and heartbreak to come. By questioning whose position the visuals are being seen from and providing at least three possible options for points of view, the scene manages to convey a delicate but cavernous set of realities rarely created through just visuals. The scene is locked in by the music of the orchestra which is mixed to occupy both major realms of diegesis allowing the visuals to explode in whichever direction they choose, often with colourful and stunning results. Sound And Music In Cinema About The British Working Class (Part 1).